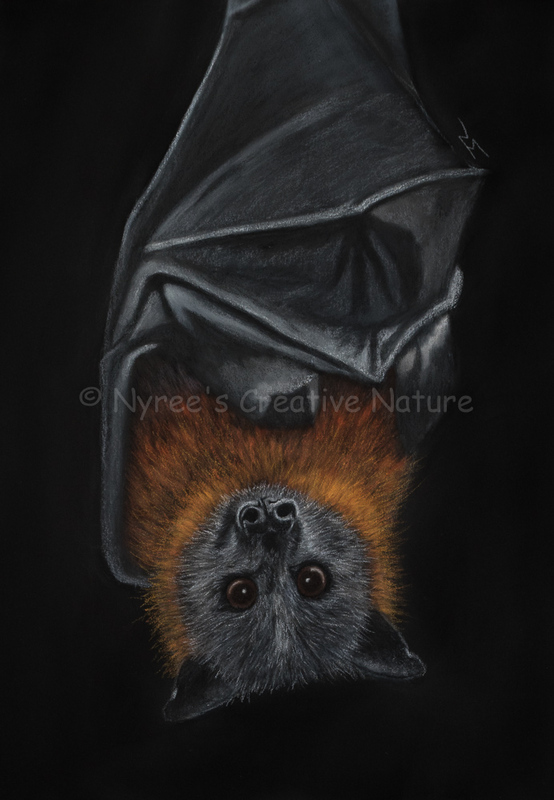 If you are interested in purchasing any of the available artwork, a signed limited edition giclée print, or commission something similar, please feel free to contact me . Please note that indicative prices do not include postage and handling. If possible, I would prefer pastel artwork to be picked up locally or shipped only short distances due to the delicate nature of the medium. 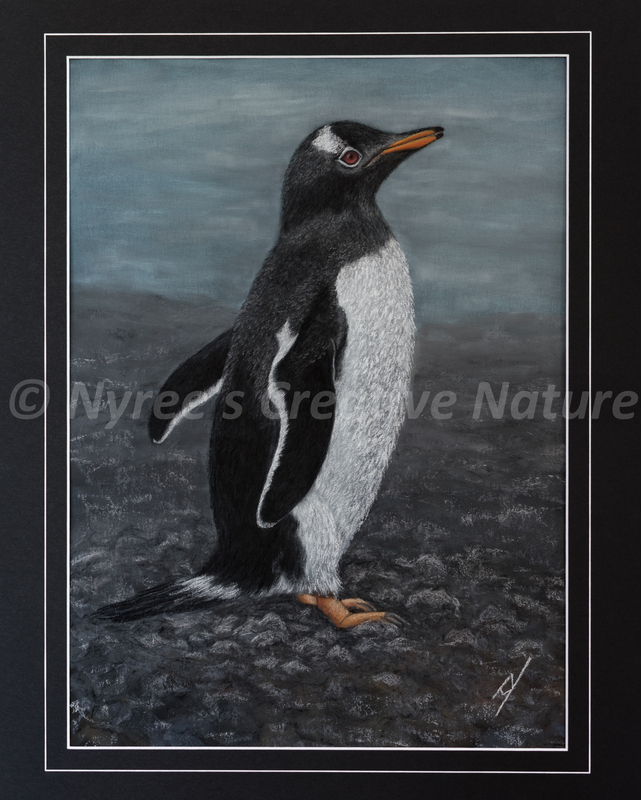 “BamBam” the Gentoo Penguin: Pastel on A3 Paper; Framed ($400). 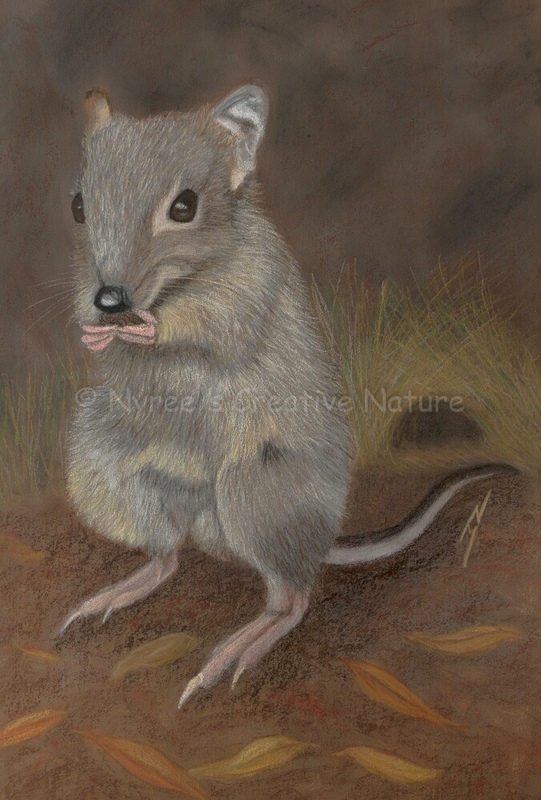 “Truffles” the Bettong: Pastel on A3 Paper; Framed ($450). 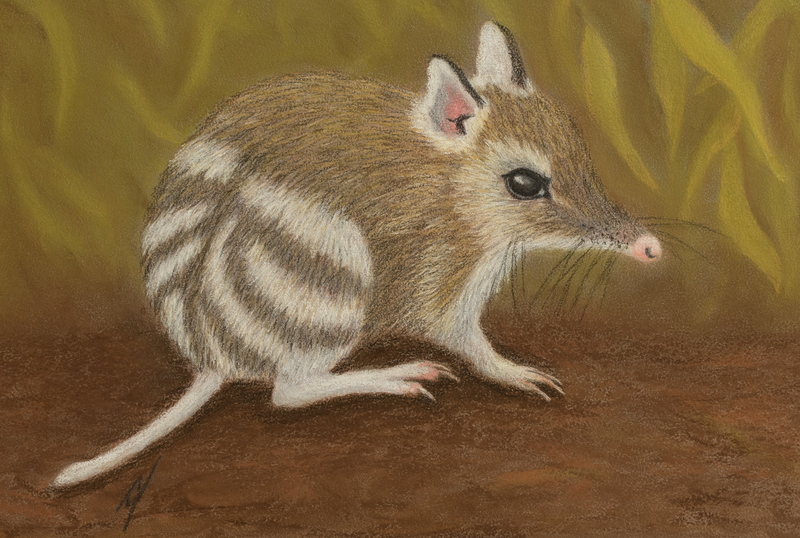 “Tim Tam” the Eastern Banded Bandicoot. 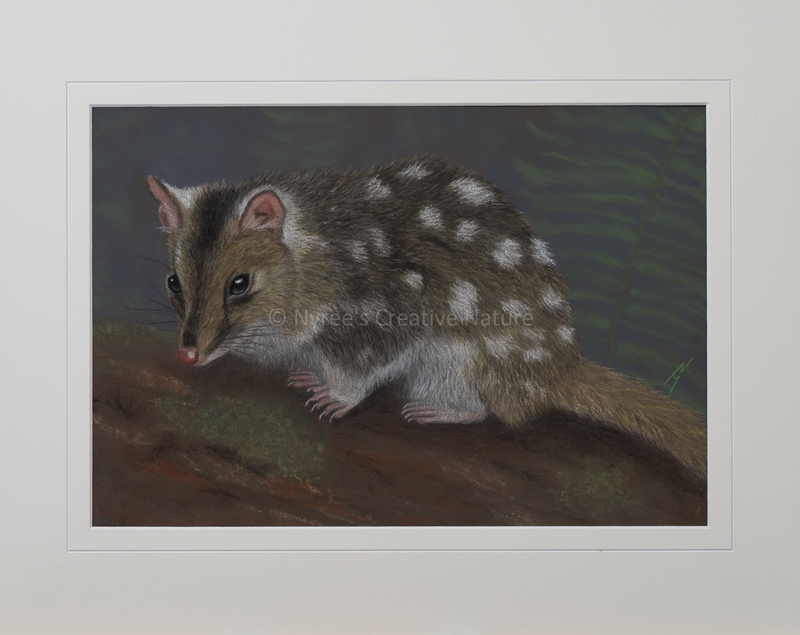 Pastel on A4 Paper; Framed; 43cm x 33cm ($250). 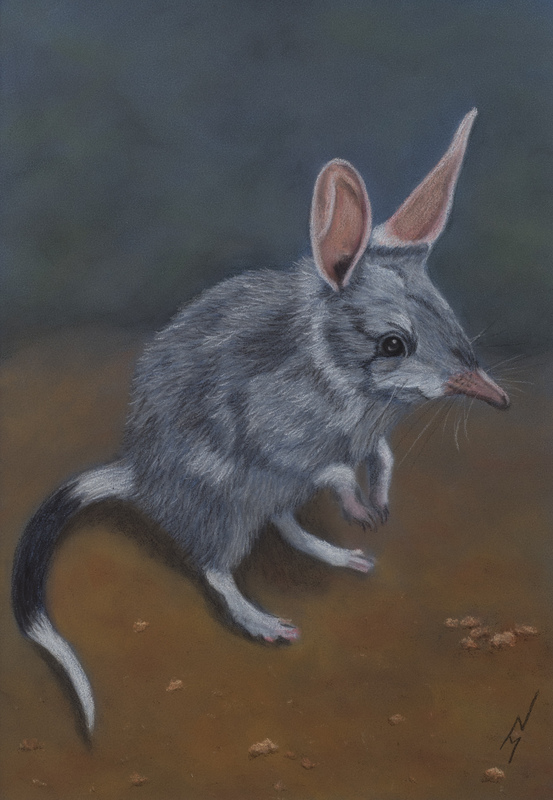 “Nibbler” the Rakali (a.k.a. 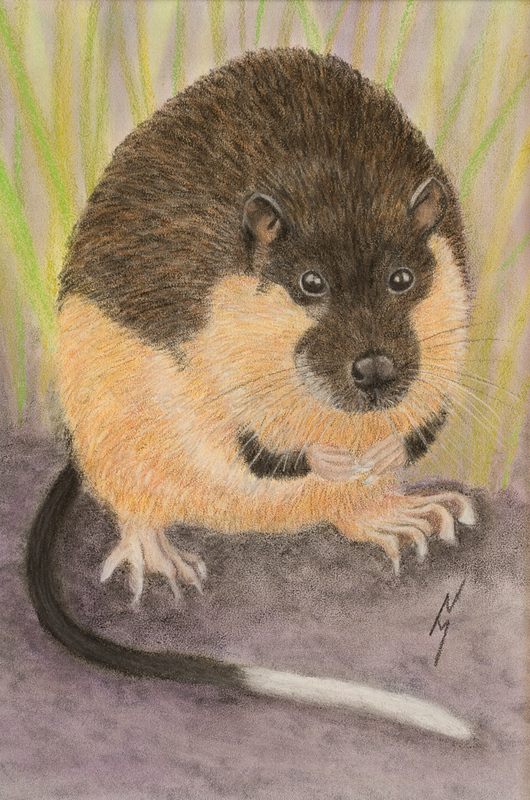 Water Rat). 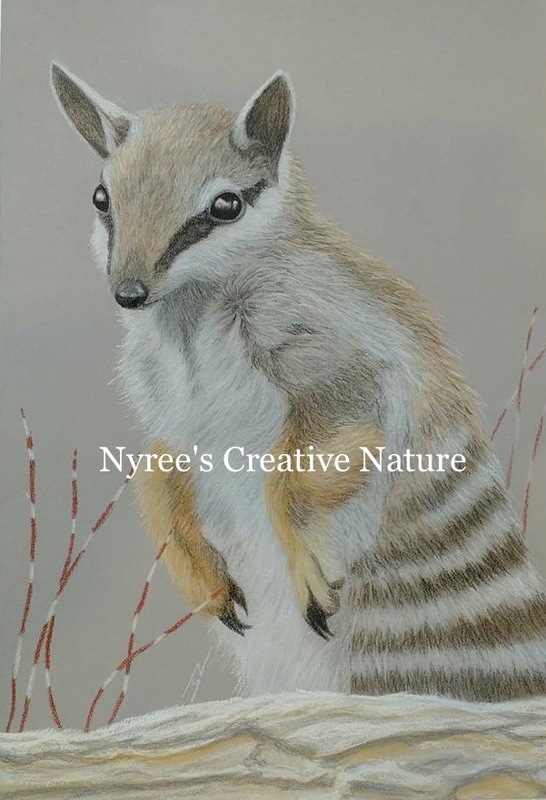 Pastel on A4 Paper; Framed; 32cm x 42cm ($220). 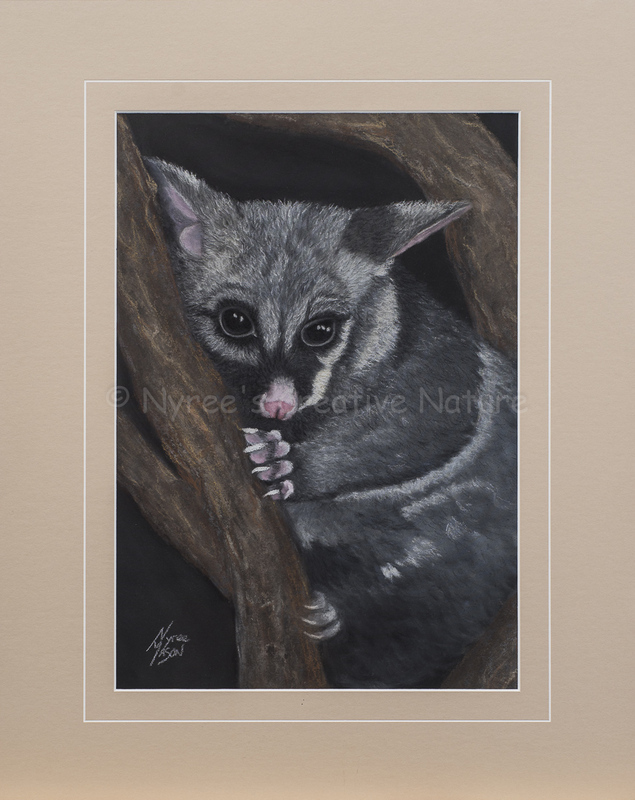 “Maxine” The Feather-Tailed Glider. Pastel on A4 Paper. 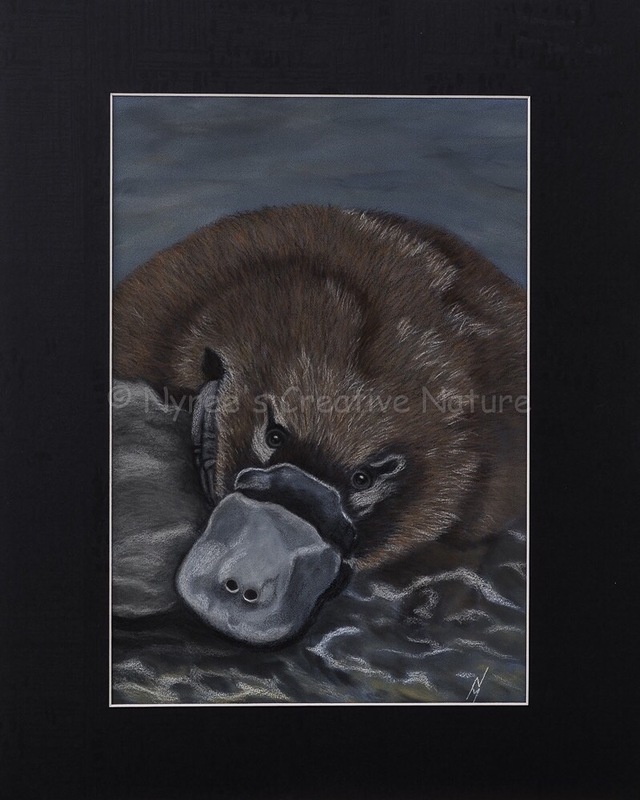 (Donated to my Art Group’s raffle). “Vince” the Frill-Necked Lizard. 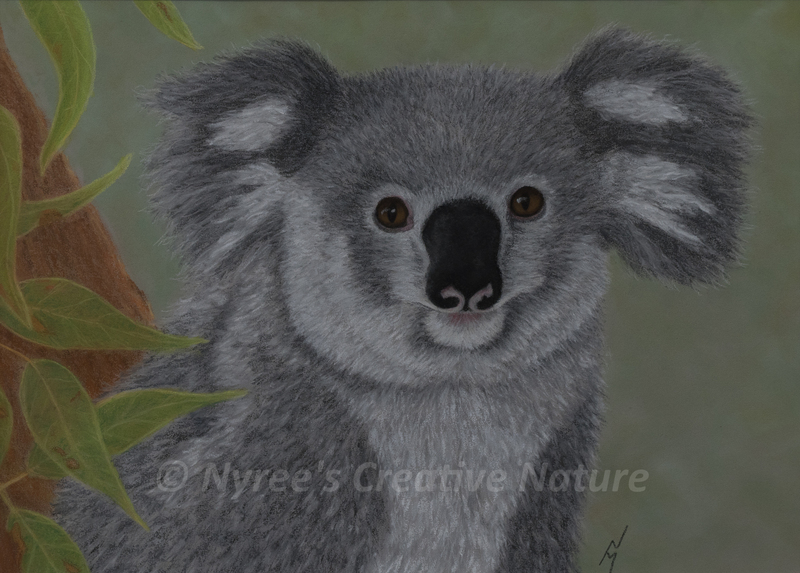 Pastel on A4 Paper; Framed; 45cm x 45cm ($350). 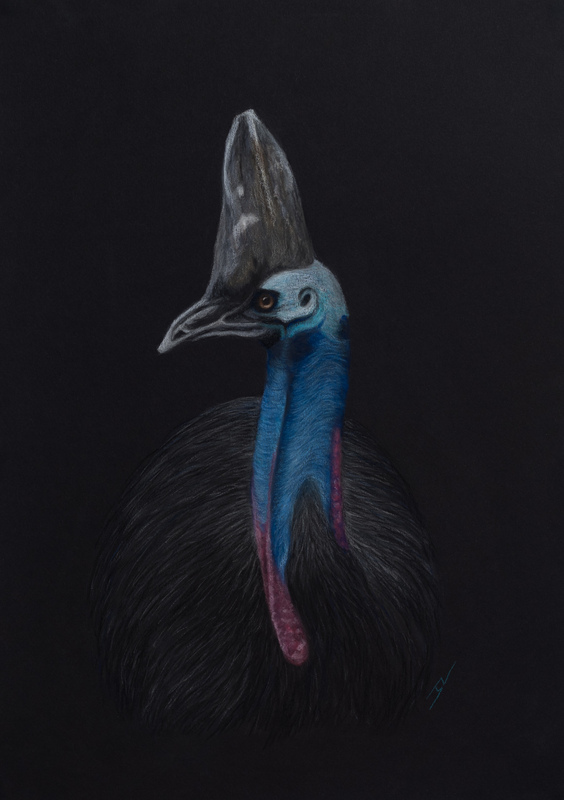 “Horatio” the Cassowary: Pastel on A3 Paper; Framed; 43cm x 53cm ($400). “Gang Gang Gajang”: Pastel on A3 Paper (SOLD). Cards & Limited Edition Giclée Prints available. 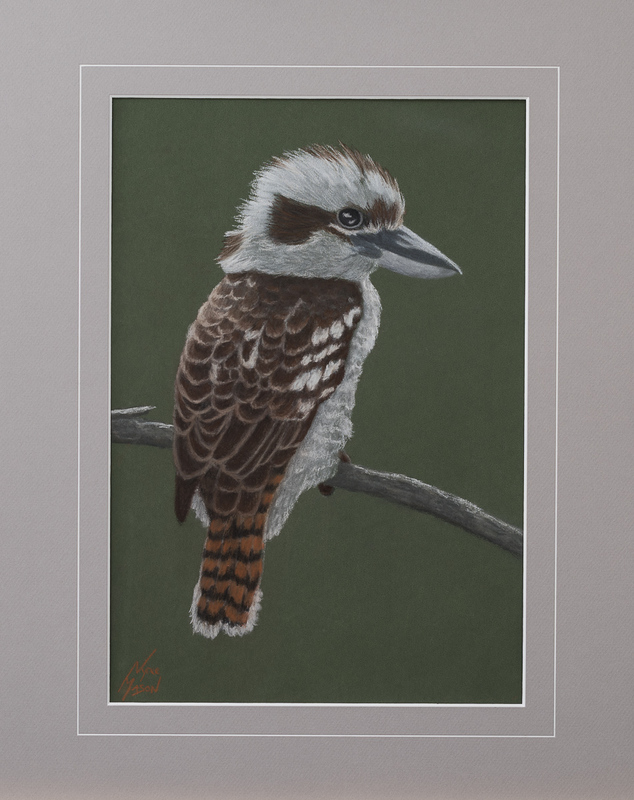 “Keith” the Kookaburra: Pastel on A3 paper. (SOLD). 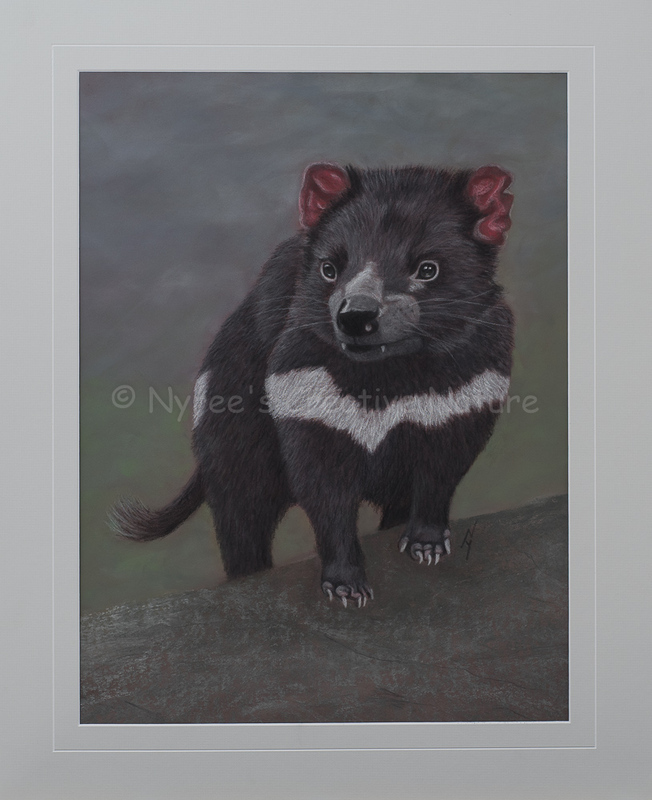 Cards & limited edition Giclée Prints available. 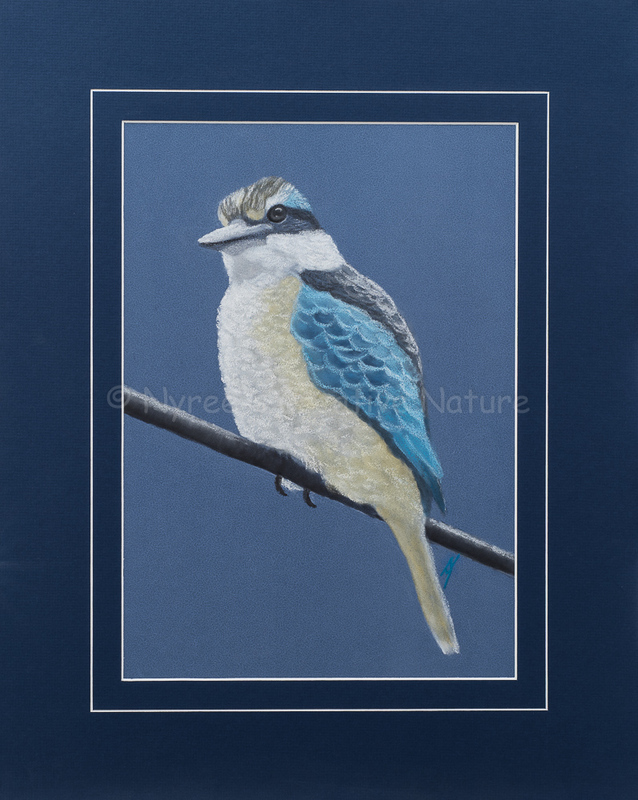 “Anique’s Sacred Kingfisher”: Pastel on A3 Paper (SOLD). Cards & limited edition Giclée Prints available. 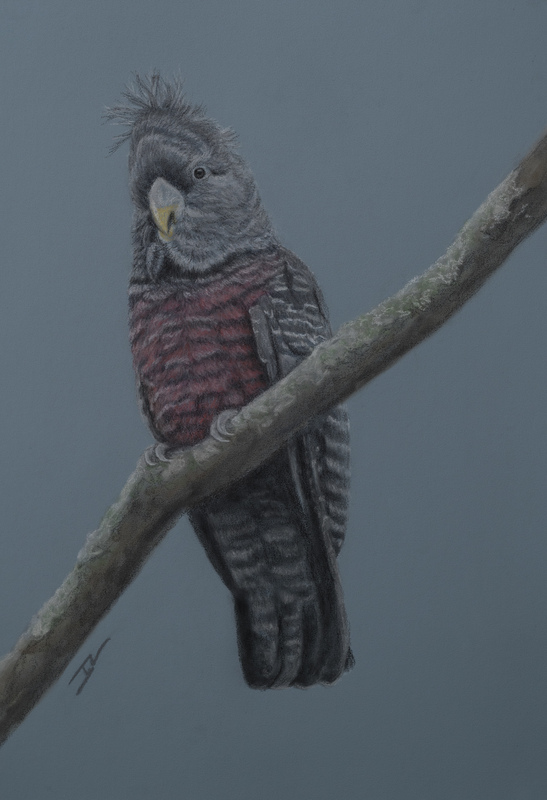 “Dad’s Galah”: Pastel on A4 paper. (GIFTED). “Mr. 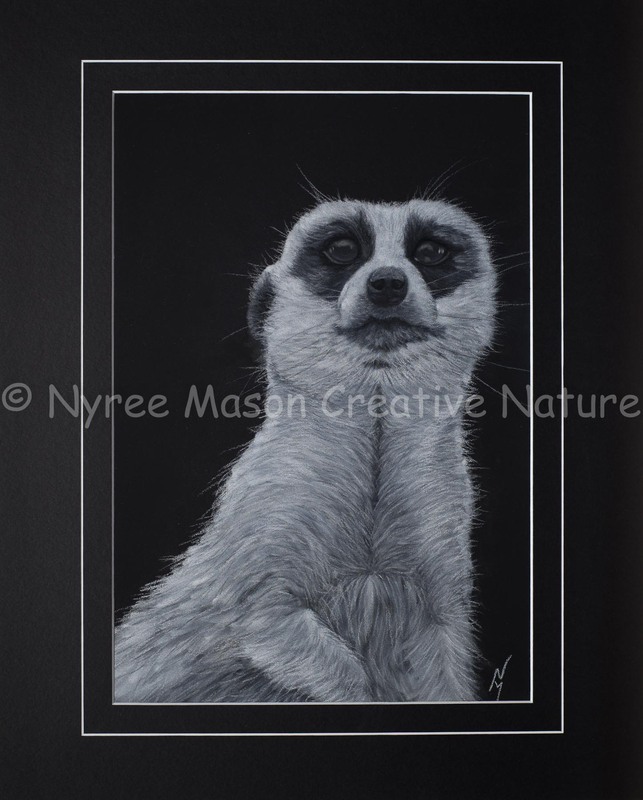 Charming” the Meerkat: Pastel on A3 paper. 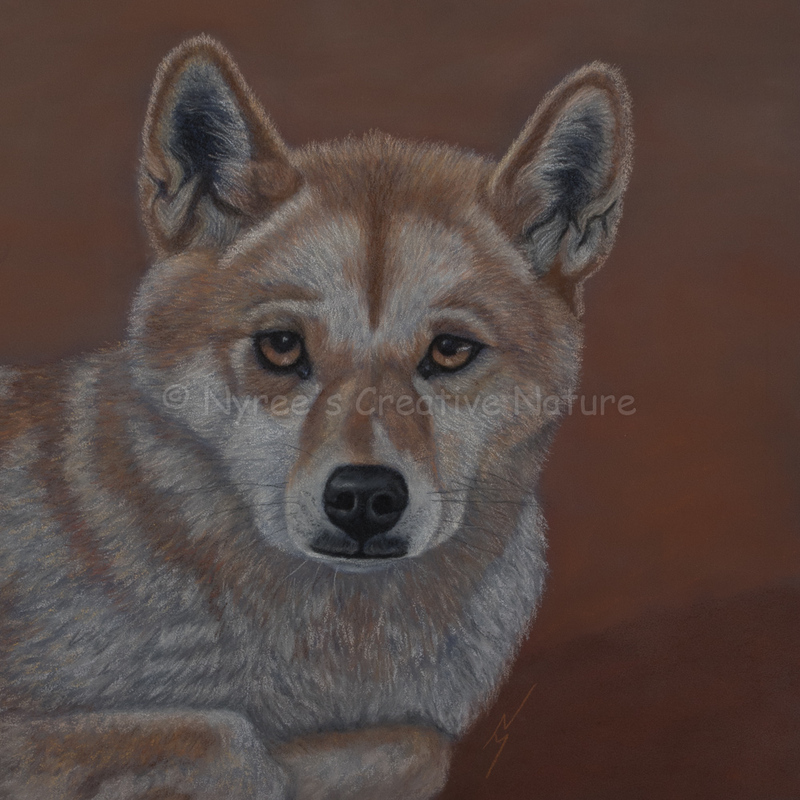 1st Prize, Pastels, Queanbeyan City Council Exhibition, QAS, 2015. (Not For Sale). Cards and posters available. 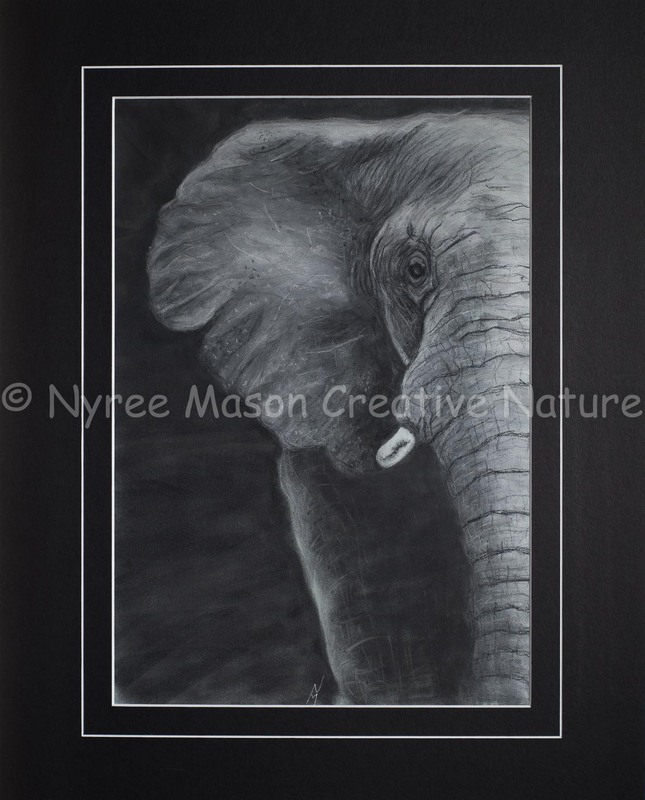 “Noble” the Elephant: Pastel on A3 Paper. Donated to the NZA. (SOLD). Cards available. 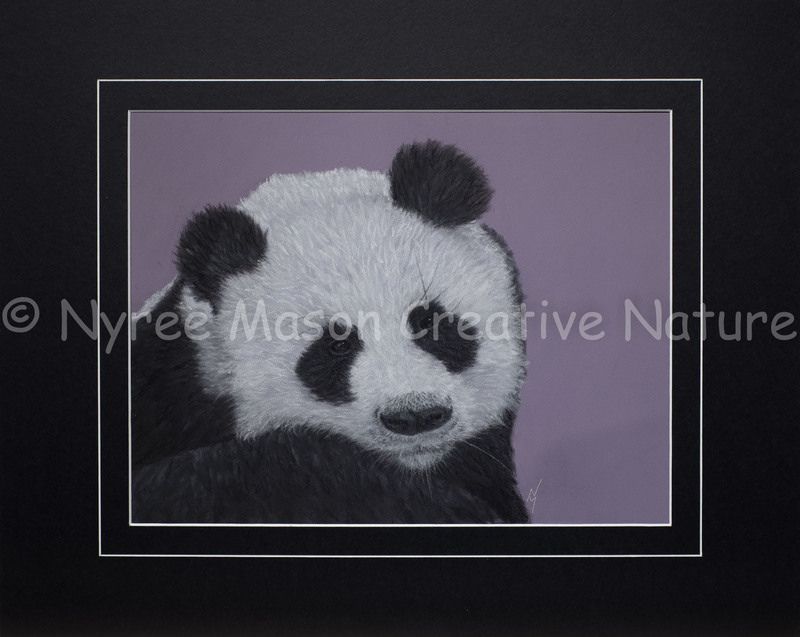 “Softy”the Panda: Pastel on A3 Paper. 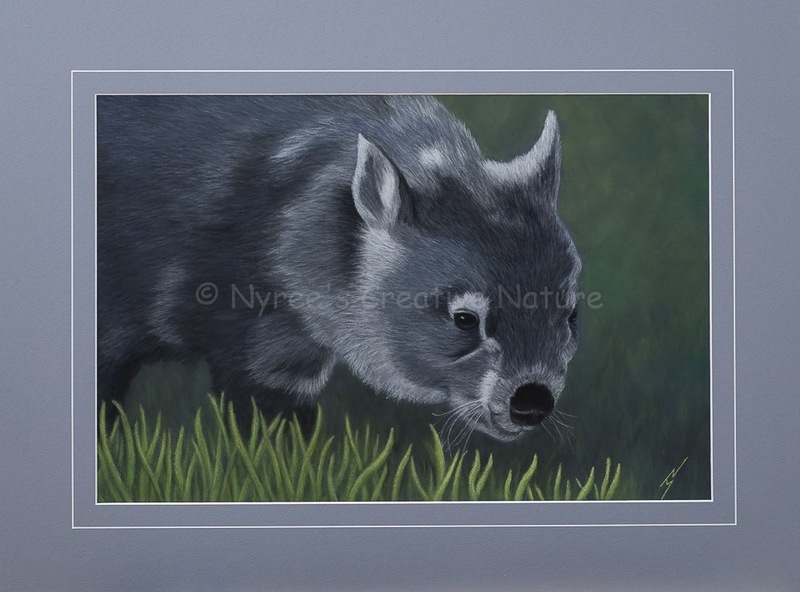 DONATED to the National Zoo and Aquarium (NZA). Cards available. 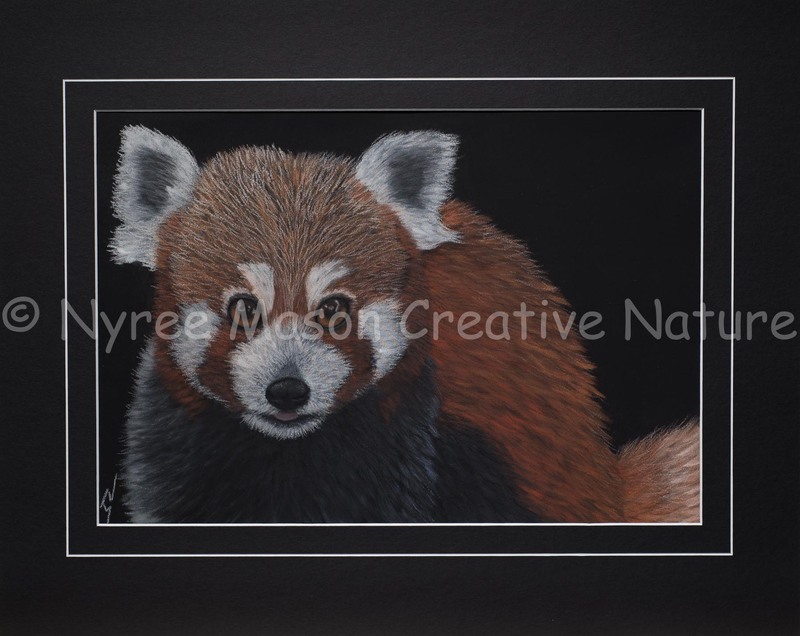 “Pete” the Red Panda: Pastel on A3 Paper; Framed; 54cm x 43cm. (SOLD). Cards available. 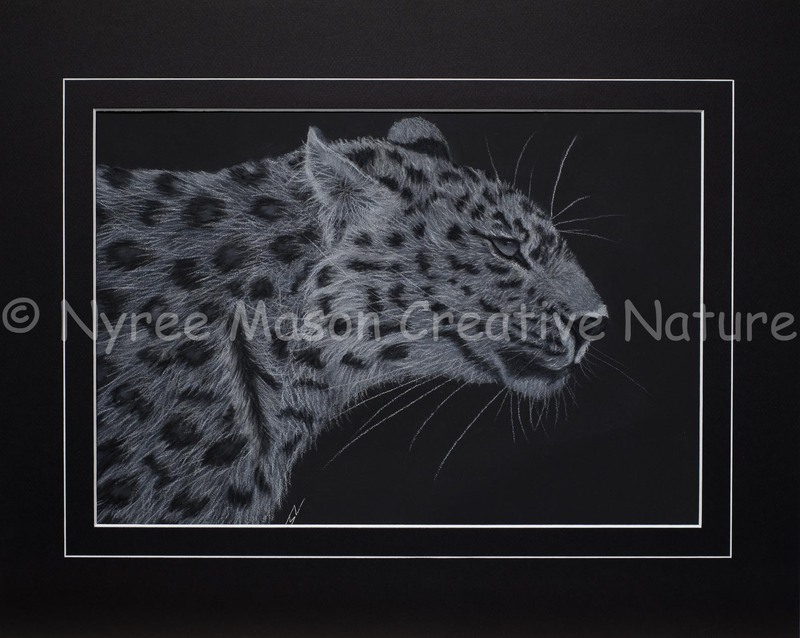 “Sleek” the Leopard: Pastel on A3 Paper. Donated to the NZA. (SOLD). Cards available. 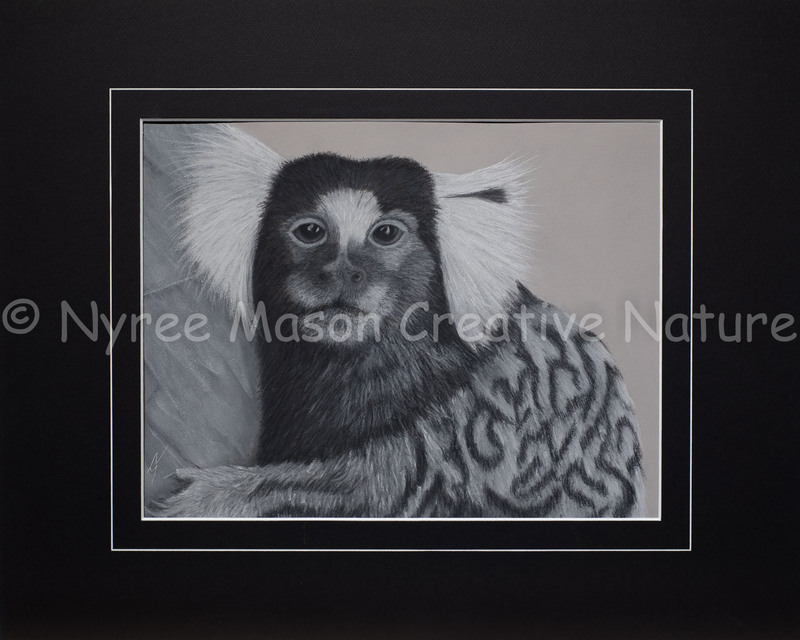 “Diego” the Common Marmoset: Pastel on A3 Paper, Framed; 54x43cm. ($200).